You would be hard-pressed to find a more aggressively-styled and imposing vehicle on the road than the 2014 BMW Z4. Outside of some exotic sports cars with well over six-figure asking prices, the Z4 will turn more heads than just about any roadster out there. Its athletic stance is bolstered by standard 17-inch wheels and penetrating LED running lights. 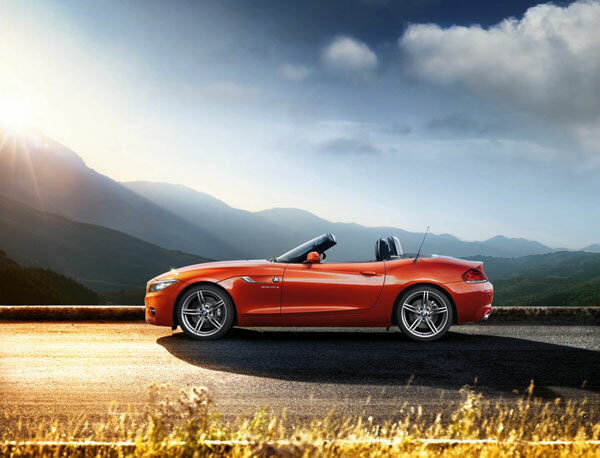 The 2014 BMW Z4 is powered by one of two turbocharged engines. The base engine is a 2.0-liter turbocharged four-cylinder that generates 240 horsepower and 260 lb-ft of torque. The available 3.0-liter turbocharged V6 produces 300 horsepower and 300 lb-ft of torque, and drivers who opt for the Z4 sDrive35is trim will see those figures rise to 335 horsepower and 332 lb-ft of torque thanks to an upgraded variant of the same V6. Don’t let well over 200 horsepower performance scare you off when it comes to fuel economy; the 2014 BMW Z4’s base turbocharged four-cylinder still manages to return an impressive 22 mpg city and 34 mpg highway. The higher-performing V6 returns 19 mpg city and 26 mpg highway, while its sDrive35is enhancements lower those numbers to 17 mpg city and 24 mpg highway. Despite a reputation of performance models, BMW is still a luxury automaker and the 2014 Z4’s upscale cabin filled with premium materials. There are no shortage of standard technological features, which include dual-zone automatic climate control, eight-way power seats with four-way lumbar adjustments, Bluetooth audio and phone connectivity, HD radio, and an iPod/USB interface. Standard safety features on the 2014 BMW Z4 include traction and stability control, antilock brakes, side airbags, and the BMW Assist eCall system, which features automatic crash notification.